Amsterdam, The Netherlands –- In refugee camps and at military camps, the power supply is often a huge cost item. Diesel generators consume large volumes of fuel and are environmentally unfriendly. 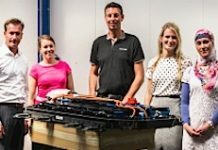 Three students from the University of Applied Sciences in Amsterdam (HvA) have been looking into a potential solution: the use of end-of-life batteries from electric cars as a source of renewable energy.